If your New Year’s resolution includes eating healthier, I have the perfect breakfast for you: Egg White Oatmeal. I know it doesn’t sound like pancakes and bacon. It’s better…for you! In researching this recipe, I found people make egg white omelets and put them on top of their oatmeal. Interesting but not my kind of breakfast. Some people microwaved this oatmeal, but I don’t like to cook in my microwave. I mainly use it to re-heat. I prefer to cook on the stovetop. You can make this oatmeal your own with your add-ins. I like a sprinkle of brown sugar and some dried apricots. You can add whatever you like: nuts, bananas, fresh fruit, or cinnamon. The ideas are endless. Just keep in mind this takes about 15 minutes to make. Not a recipe to make when you’re in a hurry. It’s a perfect recipe for a cold, snowy day. I’m talking to you New England! In a small pot, combine the oats and water. Bring this mixture to a simmer and cook for about 5 minutes until the oats have absorbed most of the water. Stir this mixture frequently! At this point you stir in the egg whites and vanilla. Whip the oatmeal mixture with a fork until it’s well blended. Stir in butter if you’d like. I think it helps with the creaminess. Continue to cook the oatmeal for another 4 minutes (approximately) at a simmer. Keep on stirring. The oatmeal should now be creamy. When the water and egg whites have been absorbed, take the pot of the burner. This is when I like to add my apricots and anything else I have on hand. I put the cover on and let it sit for a few minutes. The heat helps soften any dried fruit. This recipe is for one person. It makes a healthy amount of oatmeal and is very filling. The calorie count will vary depending on what you add in, but as is written, it’s about 300 calories. This should hold you over until lunch. The egg whites give you that extra protein your body needs, without the calories of the yolks. TIPS: Make sure you have your add-ins ready before you start cooking. You spend a lot of time stirring and you wouldn’t be able to prepare the add-ins. If you want to make more than one serving, double the recipe. For consistency sake, I like to double the amount of water to the amount of oats. I don’t like to waste food, not even egg yolks. For this recipe I usually use the liquid egg whites that are in the refrigerated section of the grocery store. I also have on hand powdered egg whites. I like to make meringue cookies and the powdered eggs work great. You just have to remember to leave time to dissolve them in the proper amount of water. While your coffee is brewing is a good time for that. No Bones About It ???? Christmas has come and gone. It was wonderful but I am glad it’s over. As usual, I’m exhausted. I loved having all the kids home. I loved making delicious food. I loved the happiness we all shared for several days. 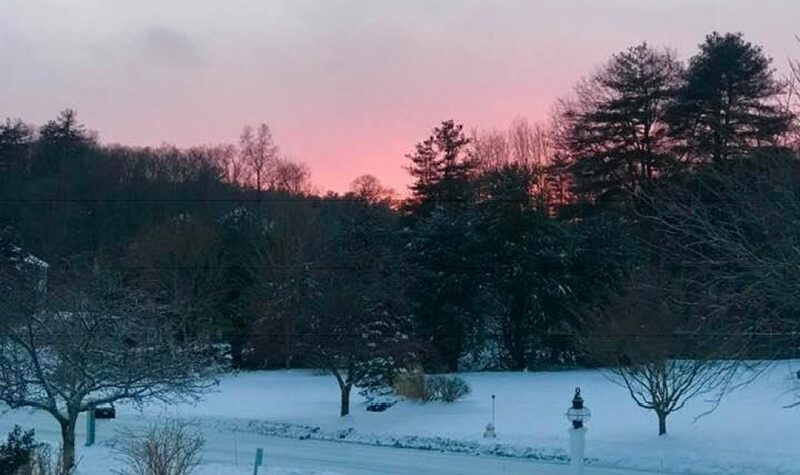 I loved visiting family and loved even more, returning home. I never thought we would eat every morsel created in my kitchen. But.we.did. All I have left is a ham bone. This ham bone will continue to give us nourishment in the form of split pea soup. Don’t scrunch your nose in disgust. Split pea soup is delicious and nutritious. The split peas are high in fiber, iron, protein and some calcium too. Add in the onions, celery, carrots, some cut ham and you have another meal in a bowl. Do yourself a favor and have some real split pea soup. Order it at a good restaurant, but please don’t eat the canned version. I love to throw in a handful of oyster crackers in mine. Perfect for a cold winter’s night. Try it some time! In a large stockpot, add the rinsed peas and cold water. Bring the peas to a boil. Once they come to a boil, take them off the burner and cover the pot. Let the peas and water sit for 1 hour. Return the pot to the stove and add the ham bone, carrots, onions, celery, bay leaf, beef bouillon, salt, and peppercorns. If you don’t have a ham bone, smoke ham hocks can be used. My grocery does sell them sometimes. Put the lid on and bring the pot back to a boil. Once the soup is boiling, reduce the heat to a simmer. I let the soup cook for about 1.5 hours. Stir the soup occasionally. I let the soup cool for about a half hour of the hot burner. The next step is putting the soup through a food mill. You don’t want to pour boiling hot soup in the food mill and risk splashing yourself. Before you put the hot soup through the food mill, take out the ham bone, brushing off any split peas. Once the bone cools, pick off any bits of ham that you can. I like to ladle the soup in the food mill that is placed over a bowl. I press everything but the ham bone. If you don’t have a food mill, you could probably use a blender, food processor or an immersion blender. I like my soup smooth, but you could absolutely leave yours chunky. You could take out some of the celery, onions and carrots and then blend the soup so it’s still chunky. When it cools in the fridge it will become very thick. This soup is great to transport to work for lunch, as it won’t thin out until you heat it up. You can add some water when you are reheating, if the soup is too thick for your liking. Take some time this winter and make some soup. You will be surprised at how easy it is! Mrs. Sherman and my mother were friends, back in their newlywed years. We lived in a two family house across the street from the Shermans. Shortly after I was born, we moved a few miles away. Mrs. Sherman and her family stayed in their home. They remained friends for years and years, exchanging recipes and child rearing help. Mr. and Mrs. Sherman had six boys. She knew how to cook for a crowd and still be frugal. The boys brought them much joy, but they also had more than their fair share of tragedy and sadness. At some point they moved out of town and our contact with them was mainly by Christmas cards. 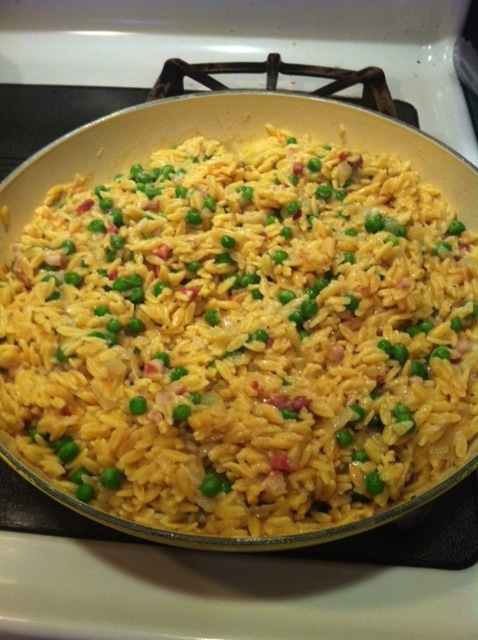 I have several of Mrs. Sherman’s recipes that I use regularly. I always think of her. She was tough as nails, but always a lady. Thank you Mrs. Sherman. I hope you’ve found some peace and happiness. Beat 2 eggs together, reserving some to brush on top of the cookies before cooking. Mix these ingredients and then stir in 1 cup of raisins and 1 cup of chopped walnuts. 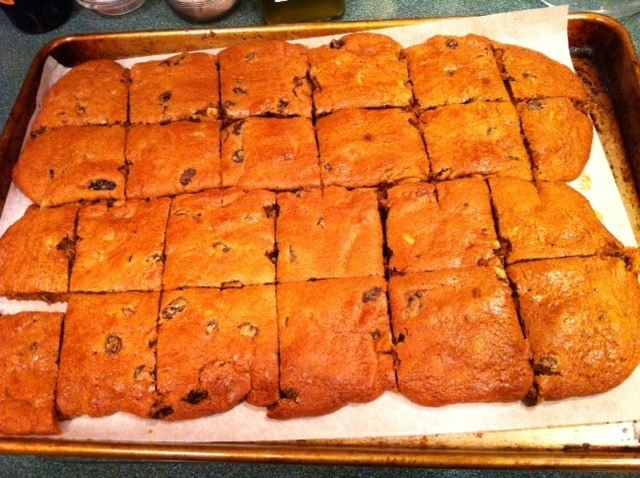 Place parchment paper on a cookie sheet, spreading the batter in two strips. Brush the reserved egg. Bake at 350 degrees for 15 to 20 minutes. Cut into strips of cookies while still warm. Cool on rack. One of my favorite meals to make during the cold winter months is either turkey or chicken soup. It starts with a flavorful stock, rich with nutrients. The key to a tasty and nutritious stock is using chicken or turkey bones and lots of healthy vegetables. Whenever I roast a chicken I save the carcass and the icky stuff wrapped up inside of it. I remove the neck and gizzards from their wrapping and place them in a freezer bag. It’s easier to store and then put them in the pot later. The marrow in the bones is supposed to be very nutritious. Cooking the bones for a long time draws nutrients out of the bones and the marrow. You can use uncooked chicken pieces instead of the carcass, as long as it has bones. It doesn’t make a difference. You just have to use what you have in the time you have. If you do it right, the broth should be gelatinous after it has cooled. Don’t worry if it’s not gelatinous, it will still be healthy and tasty! You made it with love! I use a large pot to cook the ingredients, and then another to drain the broth into when it’s done. If you don’t have two large pots, you can ladle into smaller bowls or containers through a colander or strainer. I sometimes use cheesecloth in my colander to strain out all the ingredients, leaving me with pure stock. Place all of the ingredients into your pot. Pour enough cold water into the pan to ALMOST cover all the vegetables and chicken. I take off only the loose outer skin on the onions and leave the rest on. I think it brings a beautiful color to the stock. Bring the pot to a boil. Cover the pot and lower the heat to a simmer. Let it cook for at least 1 hour, preferable 1 ½ or more. Your home will smell wonderful. Once the stock has cooked, I let it sit off the hot burner for a ½ hour. Now it’s time to start the cooling off process. I like pull out the carcass and any large vegetable pieces and put them in a bowl or on a cookie sheet. There’s less splash when your strain the stock into the colander if all the big pieces are out. Once you have strained it into another large pot, let it sit for about an hour. You never want to put something hot in your refrigerator. It will lower the temperature of the refrigerator. I usually pour it through a mesh strainer to get all the bits out into a big pot or container and then after it’s cooled a bit, transfer to another container. I like to freeze the stock in ice cube trays and small containers, then pop into a plastic bag and store them in the freezer. If you ever need some chicken stock for a recipe, you can just pop out some cubes. When I store the stock in my refrigerator, I skim the fat off the top before I use it. It will take about 8 hours for the fat to rise to the top and the stock to become gelatinous. I love to heat up the stock and add cooked pasta like tubetti or acini de pepe and top it off with freshly grated parmesan. If there is any chicken or turkey left on the bones, I store it in a separate container and then add to my soup for a meal in a bowl. 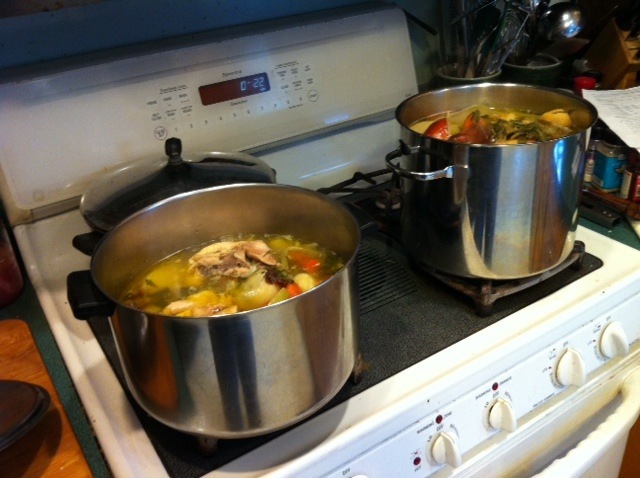 Chicken or turkey stock is very easy to make. It just takes time. Try it this weekend! Now that you have the chicken soup made, you can really make a special meal. I adapted an Ina Garten Italian Wedding Soup recipe a few years ago that my family loves. It’s simple and delicious. You have to first make chicken meatballs and then you cook small pasta and spinach in the soup with the meatballs. It really is easy. The trick is to do things in steps. One day you make the soup, the next day you make the meatballs. 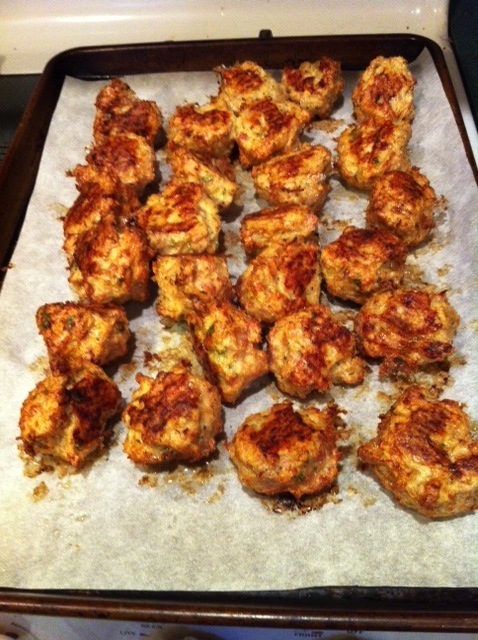 The meatballs consist of ground chicken and Italian chicken sausage….let’s make some meatballs! Remove the chicken sausage from the casings and mix it with the ground turkey. Add the bread crumbs, garlic, parsley, cheese, milk, salt and pepper and mix them together. If you’d like you can add a beaten egg. Makes them a little lighter. This mixture is very wet. The meatballs will stick to your hands, but that’s okay. On a parchment lined sheet, place your meatballs. Try to make them as small as you can. Don’t worry if they are on the large size, I usually cut them in half or quarters before I put them in the soup. Hey, this is soup, don’t sweat it. Cook the meatballs for about 30 minutes. I turned them about halfway so then brown evenly. These meatballs freeze really well too! Heat about 1/2 of the chicken stock in a pan, to a simmer. Add about a cup of small pasta, like Ditalini, to the simmering soup. Let it cook for 10 minutes. It will absorb some of the broth. After you make it a couple of times you will know the soup/pasta ratio. I like having a lot of pasta, but you need to have enough broth since the pasta absorbs some of the chicken stock. Add the meatballs and the chopped spinach into the broth. Let this simmer for about 5 minutes. I like to sprinkle the soup with parmesan when I serve it. Now this is a meal! Over the years I learned to disguise the presence of onions in my cooking by using one of my favorite kitchen tools: the box grater. It’s on my counter, ready for action. When the kiddos were younger they did not like to see onions in their tomato sauce, or meatballs…..or anything. I discovered that by grating the onions the sauce still had the onion flavor, but they were with one with the sauce. I do the same thing with meatballs. I just grate the onion into the hamburger instead of finely chopping them. When I make my mother’s potato salad recipe, I grate the onion into the mayonnaise mixture. Perfection! I love using packaged grated cheese for the ease. Sometimes when I make lasagna, I buy some mozzarella cheese and grate it myself. It really is better. The trick is to unwrap the mozzarella and put it on a plate and freeze it for about a half hour. You just want it be firm and not necessarily frozen. It grates easier this way. I usually grate it into a bowl or on parchment paper. Whatever you don’t use, pop into a plastic bag and save. During the winter months I make a lot of soup. One of my son Nick’s favorite soups is Tortellini Sausage Soup. The recipe calls for grated zucchini. I have tried doing this with a box grater and in my food processor. I prefer the results using the grater. I also think the box grater is easy to rinse off or placed in the dishwasher. Most people don’t even know there is zucchini in it. It cooks up and helps thicken the soup. Well, that and the Parmesan rind I toss in near the end. That’s a great trick to add flavor to soups. Some stores even sell just the rind. You can use your box grater for baking. I prefer using a home made pie crust. It’s not a complicated process but there are some helpful hints. The trick is have the butter and the water very cold. I unwrap the butter required for my recipe and freeze it. After it’s frozen I grate it and then re-freeze the gratings until I am ready to make the pie crust. I use my food processor to make my pie crust. You only want to mix it until the dough sticks together when you squeeze a handful of the mixture. You want to have specks of butter in the raw dough. This makes for a flaky crust. I put ice cubes in a pyrex measuring cup and then add cold water and let it sit for about 15 minutes. When I am preparing the crust, I pour out the amount I need, which usually about 1/3 of a cup of water. Cold ingredients make for a flaky pie crust. Even is you don’t want to grate the butter, cut it into very small pieces and freeze it until you are ready to make the pie crust. It really makes a difference. 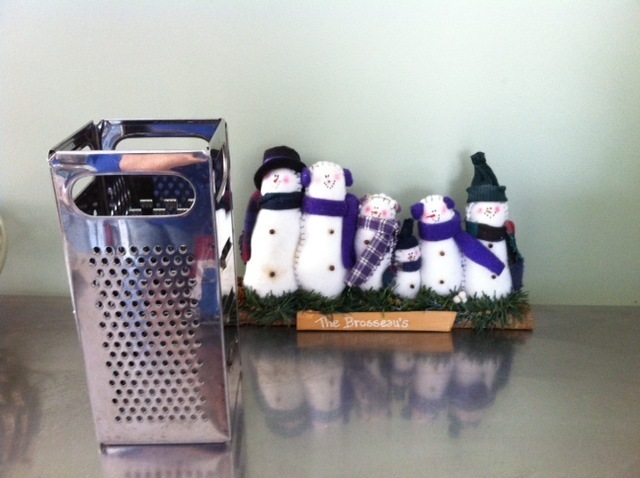 I would also suggest buying a stainless steel grater. You don’t have to buy the most expensive one, but one that will last. My first one was aluminum and got rusty. I replaced it a nice solid box grater. There are different designs of box graters. You can get ones with handles and multi-sides and basins that collect your grating. I prefer simple designs. Growing up within a Czech family, I was no stranger to poppy seeds. My father’s mother was a genius in the kitchen. She baked by feel and never measured. When she passed, my mother gave me her yellow mixing bowls. I have them hidden away in fear of them breaking. Maybe this year I will bring them out. 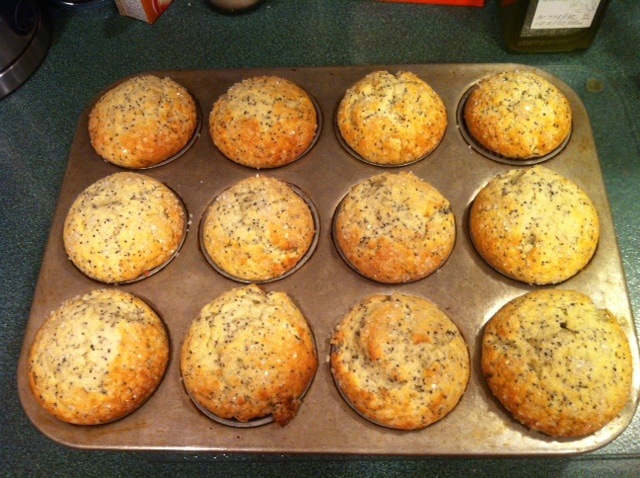 I don’t remember Grandma making these muffins, but she made amazing poppy seed pastries. Every time I make these muffins I think of her…..
Preheat oven to 375 degrees. Grease 12 muffin tins or use papers in cups. In a small bowl, stir together flour, salt and baking soda. In a large bowl beat sugar, and butter with an electric mixer for 2 minutes. Beat in eggs, one at a time, until blended; beat in sour cream and vanilla. Stir in poppy seed filling. Sometime for fun I add another small dollop of poppy seed filling…WHY NOT? Stir in the flour mixture until it’s well blended. This makes a thick batter. Spoon batter into prepared muffin cups and bake 15 to 20 minutes, or until toothpick inserted in center comes out clean. I also like to sprinkle sparkling sugar on top for crunch. Place muffin tins on wire rack and cool for 5 minutes before removing muffins from cups. Finish cooling muffins on rack. Serve warm or cool completely and store in airtight container. These freeze well too. Makes 12 muffins. You can find Solo Poppy Seed filling in the baking section near canned apple pie and canned cherry filling. Not every store carries them; you can also use just regular poppy seeds too. That’s what the original recipe calls for. I prefer the poppy seed filling!